Thank you for your expert planning and attention to detail that made our recent trip to Lima, Cusco, Machu Picchu, Iguazu Falls and Rio de Janeiro so memorable. You were able to listen to our wishes and put together a trip for us that was perfect in every way. We met so many wonderful, knowledgeable tour guides that customized each tour to our pace and interests. After a busy day of touring, you booked us into lovely hotels where we could relax and be ready for the next day’s adventure. The lunches at each stop were a delicious education into the cuisine of each country. We appreciated all of the written travel guides you sent to to help us better pack for our trip. We enjoyed excellent hospitality at each new stop and always felt safe and welcomed. 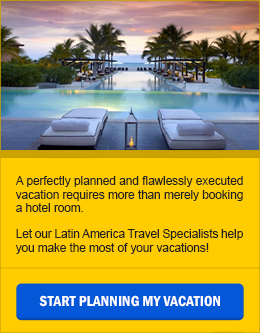 You are truly experts in this area of travel, and we highly recommend your agency to anyone planning a trip to South America.